LeblonFin’s bodysurfing crew brave the infamous and rare wave at Rio de Janeiro during the gigantic swell that struck the city. The idea was to put a team together and go check if we could bodysurf the Beast”, said Mauricio. The group also had the riders Julio Cesar Rodrigues, aka JC, from Rio, and Paulo Pilleggi, from Florianopolis (Southern Brazil). 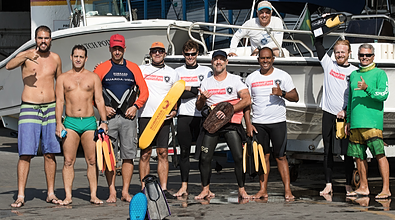 The crew had support from Rio de Janeiro lifeguard lieutenant-colonels, Fabio Braga and David Szpilman (both directors of the Brazilian Water Rescue Society), and captain Luiz Morizot, aka Dunga, lifeguard chief in the Miami-Dade county (Florida), all bodysurfers themselves. There was also a safety boat and a surf rescue jetski. Important logistics were warranted as the risk for bodysurfers were exponentially higher than with board surfers in such hairy and unpredictable wave. The raid got the green light on Wednesday (9th) when the arrival of a mammoth once-in-a-decade swell was confirmed. As it would arrive from the Southeast, many sleeping giants would be awakened, including the Beast. This infamous wave breaks over a 23 ft deep rocky slab next to Laje Island, at the mouth of Guanabara Bay. Due to its depth, the Beast only breaks with a swell at least 9 ft high from the South or, preferably, Southeast. Sunday (13) at the Beast, most waves were over 13 ft. The biggest one cleaned up the peak at precisely 1:56 PM: it was an easy 20-footer. The crew remained two hours in the water around the low tide slack, in order to avoid the strong currents that sweep the mouth of the bay . you had to duck dive very deep. Even so, after a long while you couldn’t surface right away because you couldn’t advance in the midst of foam”, added Dunga. “When the bombs passed over the slab, they suddenly jacked up. If we dropped near the slab, would be suicidal. You’d be spitted and go over the falls into the foam inferno. So we’ve tried to ride the shoulders”, explained Pillegi. But the shoulders melted instead of open because waters around the slab are at least 50 ft deep. And the waves were fast, over 20 mph. The riders had a hard time trying to drop. And there it went until the moment when Russo was on the sweet spot at the right time. “I’ve noticed the shoulders backed off a lot. So I positioned myself closer to the critical area without risking too much. I’ve taken bearings on land and tried to remain on that spot. Sooner or later one will pass through here”, Russo told. him. “As I’ve watched that huge wall, the shoulder seemed to open. So I’ve started to fin and paddle madly. To my surprise it did open as the wave jacked up. When I saw that huge open ramp in front of me I’ve dropped and made the line. I’ve rode for long while, bumping around, with foam in the face until the wave crumbled and died. Dude, it was awesome. I cannot believe still. I’m so stoked”, cheered Russo, the first bodysurfer to conquer the Beast.